Alexa’s frames are from Skechers, and Goldie is sporting sunglasses from Icon Eyewear. When I was a kid, I wanted glasses SO badly. When, in 7th grade, I found out I actually needed glasses to see distance, I was over the moon. I promptly picked out a pair of oversized red frames (a la Sally Jesse Raphael- I know, I know…) and wore them 24/7. To this day, I LOVE wearing glasses- even when I don’t necessarily need to! Which is why, two years ago, when my daughter Alexa found out that she needed glasses, her reaction surprised me. She was devastated. Hysterical. Defiant. Nobody else in her class had glasses, and she didn’t want to stand out. I mean, how could this be my kid?! I went on and on about how lucky she was to GET to have glasses and how cool it would be to get a few pairs and match them to her outfits (just like she did with her hair bows at the time) every day. Since preschool, Alexa and I have had a tradition- we get manicures together, and then buy a backpack the day before school starts. This year, we added a trip to our local eyecare provider to shop for new eyewear to the itinerary; armed with trend scoop I am privy to as the style expert for The Vision Council. While generally my 7-going-on-17-year-old daughter thinks I am clueless, she does admit that when it comes to picking out glasses, I may actually know a thing or two. Keep scrolling to check out the top children’s eyewear trends for Fall 2018, so you too can be in-the-know in the event that glasses are on your back-to-school shopping list (and bookmark this, because, well, take it from me- they may not be on your list currently, but you never know!). And if your kiddos haven’t had an annual eye exam yet this year, make sure to get that on the books. (Side note: We had the best time shooting images for this post with our neighbors/besties Julian and Simone- love seeing how eyewear totally brings out different parts of everyone’s personality, right?! The frames featured are, from top left, Polaroid Kids, Icon Eyewear, Lulu by Lulu Guinness Kids, Icon Eyewear (Goldie snagged them from Alexa! ), Lulu by Lulu Guinness Kids (had to include 2 shots of that pair, Simone looks so adorable in them! ), Skechers and Icon Eyewear. ﻿Colors- Shades of seafoam, sky and teal are having a moment, and while pinks and purples are always hot in this category, grape and soft and hot pink hues are especially in style. 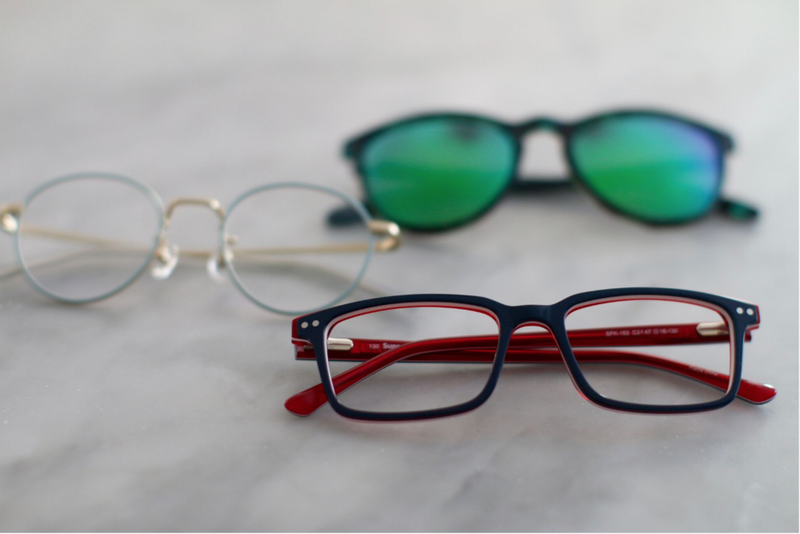 Neon green is the go-to statement shade, and there are lots of multicolor frame offerings as well. 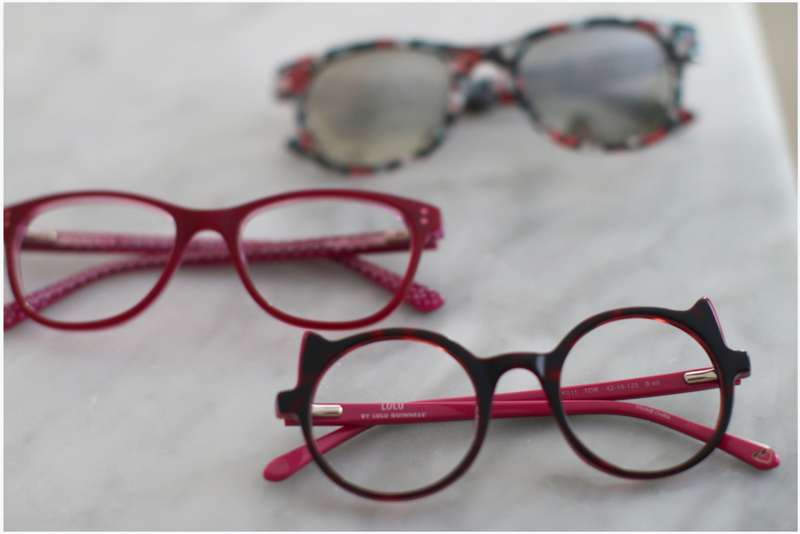 Shapes- Bring on the whimsy- cutesy animal shapes are super fun, as are heart-shaped and sassy cat-eye frames. Bookish rounds have a vintage vibe, and of course, old-school aviators and wayfarers, along with classic rectangle shapes, are timeless. And whether she is on the field or simply a fan of sporty style, sporty wraparound shapes are recess-ready! Details- This is where it gets exciting- girls can express their personalities with prints, glitter accents, gem embellishments or sophisticated double bridge styles. Translucent effects, two-toned coloration, and gradients elevate the color trends to make unique style statements. ﻿Colors- Green is a definite go- be it mint, forest or an electric shade. A prevalence of turquoise and indigo blues, citrus reds, oranges and yellows demonstrate that brighter may just be better this Fall, while unexpected pops of white and tortoise round out the options with an element of sophistication. Shapes- Rectangular silhouettes come in modified, rounded and sporty versions as well as the quintessential classic, but there are also easy-to-wear-rounds, shield-inspired shapes and whimsical ovals to choose from. Details- Stripes, camouflage and abstract patterns are the bold way to go- while milky effects, double and keyhole bridges and layered accents subtly provide pops of personality. For a full rundown of the trends, check out The Vision Council’s Eyecessorize Children’s Fall 2018 Look Book HERE. And for more details about eyewear and eye care, visit Eyecessorize.com. Note: This post is sponsored by The Vision Council, but all opinions are completely my own!